Lucy. He stared at me and told me to look into his eyes! Van Helsing. And Evelyn, what do you get if you spell "Alucard" backwards? Howard. Don’t be ridiculous, Franz, now is not the time for childish word games. Howard. It must be some sort of a coincidence. Lucy. (She sits DS end of sofa) It’s no coincidence, dad. Dr. Van Helsing is right. Look at the facts. I clobbered Alucard with my five iron. He fled from my room. I ran down here. You sent Janet upstairs to get the Professor. She saw a bat. Then we saw the same bat when it flew from the hallway into this room and out the french doors. Janet. That explains why I couldn’t find him. Vampires can change into bats. Your friend, Alucard, changed into a bat, and made his getaway. Lucy and Janet. There are wolves! Janet. But according to the vampire legends, once a person is bitten by a vampire, that person becomes a vampire herself. Van Helsing. (A step to Janet) The legend is imprecise. It is not the bite of the vampire that transmogrifies the victim. Rather it is the draining of the victim’s blood. Janet. (Crossing to Van Helsing) But if Lucy was bitten by a vampire, why didn’t he drain all her blood then and there? Janet. Or perhaps, Lucy had forgotten to shower! Lucy. That would explain why he came into my room tonight! Van Helsing. He no doubt came to finish what he had begun. Lucy must not be left alone while Dracula is on the prowl. Janet, can you stay with her at all times. Janet. You’re asking a great deal. ... She snores! Renfield. (Entering from Hallway down stage left, and crossing to Doctor Howard) My Master has sent me for some more aspirin. Howard. (To Van Helsing) It’s Renfield. He’s the chair of our Biology Department (To Renfield) Renfield, who’s your Master? Why does he need aspirin? Renfield. Why, Professor Alucard, of course. His headache is suddenly much worse. Van Helsing. Where is your master, now? Van Helsing. (Van Helsing crosses to Renfield. Howard counters) What did you just put in your mouth? Renfield. A horsefly. Would you like one? I have another. Van Helsing. Thank you, Renfield, but no thanks. I just had dinner. Van Helsing. Thank you, but I’m on a strict diet. Renfield. So am I. That’s why I eat them. They’re high in protein and low in cholesterol. And no sugar. Are you sure you won’t have one? Van Helsing. Thank you, but not now . Mr. Renfield where is your master now? Renfield. I just told you, I don’t know. (Hesitating) I can’t tell you. Van Helsing. (Sensing Renfield knows more than he is letting on) Tell me, and I’ll give you a one pound box of nice fat horseflies. Renfield. My master will get angry if I betray his secrets. Howard. We will get angry if you don’t, and we’ll put your flies under lock and key. Janet. Offer him a two pound box. Disguised as Professor Alucard (Dracula spelled backwards), Count Dracula takes a teaching position at a small women’s college. 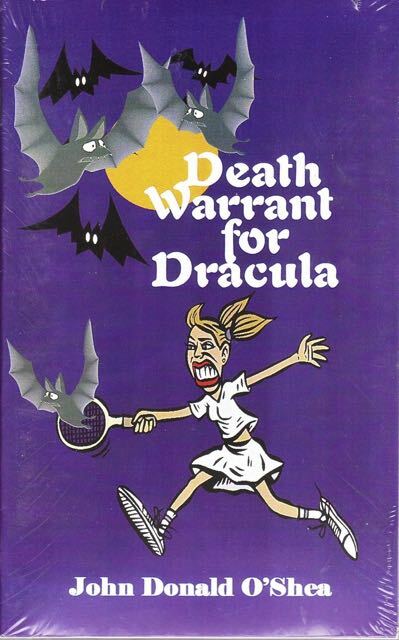 This time, instead of preying upon hapless Victorian females, Dracula finds himself the victim of an accomplished student athlete, Lucy, who is more than happy to clobber him with her tennis racket and golf club. And if that isn’t bad enough, Dracula encounters a host of zany faculty members including a biology professor who crawls on the floor and eats insects, a music professor who writes horrendous musicals, and a spooky poetry-reciting English literature professor who has corrected one too many exams. When Dracula is eventually captured, he discovers that modern vampire hunters aren’t exactly “old school.” Instead of simply driving a stake through Dracula’s heart, these “politically correct” vampire hunters can’t stand the sight of blood and can’t bring themselves to kill Dracula even though he has been dead for 400 years! To Dracula’s horror, the hunters contemplate even more cunning ways to curtail Dracula’s taste for human blood - like filling his fangs with Super Glue and/or forcing him to become a vegetarian! The Place: St. Vitus College. A small women’s college. When I wrote this play, I was taken by the fact that Dracula's traditional victim was a delicate, hapless and helpless Victorian female. This did not comport with my understanding of the the late twentieth century woman. Indeed, my daughter and her friends, were almost without fail, excellent female athletes, adept in the use of such weapons as baseball bats, tennis racket and golf club. Consequently, I wondered what might happen if the "ole Count" singled out one of these girls? I felt he might be in for a rather unpleasant surprise. Ergo, this tale. Professor of Theater at St. Vitus. Women, and a Medical Doctor. A student at St. Vitus. Lucy’s friend.